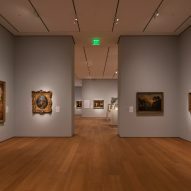 The Norton Museum of Art in West Palm Beach, Florida, is reopening following an overhaul by Foster + Partners, featuring a roof that curves around an old tree and a botanical garden for sculptures. 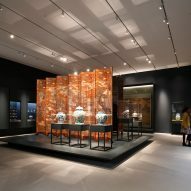 British firm Foster + Partners completed the renovation of the museum on Olive Avenue three years after work began on the project. 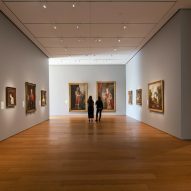 The scheme aimed to revert the Norton Museum of Art back to its simple axial arrangement, as conceived when it was built in 1941 by architect Marion Sims Wyeth as a series of single-storey, art-deco pavilions arranged around a courtyard. Alterations made over the years, however, had confused this layout. 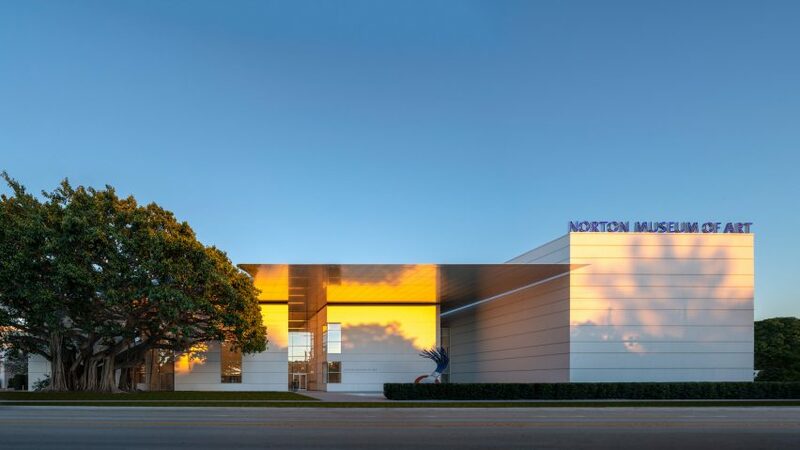 "The revitalisation of the Norton is rooted in revealing and enhancing the original spirit of the building," said Norman Foster in a project statement. 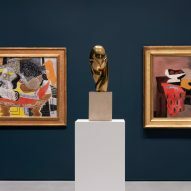 "Over the years, the museum had lost its sense of identity in the neighbourhood," he added. "The entrance had been moved to a side road, and there was no presence of a museum." To resolve this, Foster's scheme adds a new 59,000-square-foot (5,480-square-metre) wing to the western side, creating a new entrance and a stronger presence facing the city's South Dixie Highway. A huge roof on top curves around an 80-year-old Banyan tree. Reaching 43 feet (13 metres) above the ground, the canopy shades the entrance from Florida's harsh sunlight. Three double-height wings behind bridge the galleries in the existing low pavilions with the three-storey Nessel Wing, which was added to the museum in 2003. 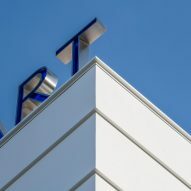 All buildings are covered in horizontally banded white stucco, to match the art deco-style of the older structures. Inside, the new trio of buildings host an auditorium, a great hall, an education centre, an event space, a museum shop and a restaurant. 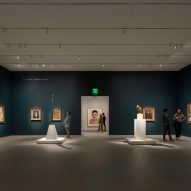 "The new design redefines the museum's relationship with its surroundings by providing a main entrance on the original central axis," Foster continued, "while creating new event and visitor spaces that will transform the museum into the social heart of the community; as well as increasing the gallery and exhibition spaces, to engage with a wider audience." 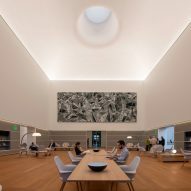 In addition to resolving the layout and extending the museum, Foster + Partners wanted to create plenty of green space to make the most of Florida's warm climate. An asphalt car park on the southern side of the museum was transformed into green space. 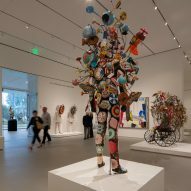 This will be used as "outdoor galleries" for the Norton's growing sculptural collection. 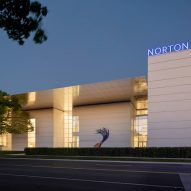 "Just like an artist studies a piece of stone before turning it into a piece of sculpture, the transformation of the Norton Museum of Art was inspired by its context – the light and flora of Florida, as well as the setting of the original gallery," said Foster + Partners partner Michael Wurzel. 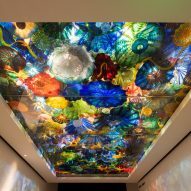 "The new museum and the surrounding landscape have been delicately interwoven to form a unified ensemble that will be a new landmark for West Palm Beach." 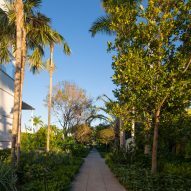 Vegetation, including 272 trees and shrubbery, was selected by Foster + Partners' landscape architect Neil Bancroft to suite the subtropical climate, harsh hurricane winds, and lack of water in drought season. Tree canopies are intended grow big enough to provide shade for the public to enjoy a dining area in the garden, Bancroft revealed when unveiling the scheme last year. The canopy will also shelter the non-native vegetation, which was added for colour. 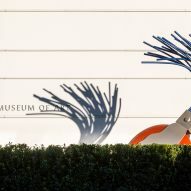 "In the past, there was no outside space for visitors to enjoy, but now the perimeter of the museum'As expanded grounds is defined by a new landscape," said Foster + Partners head of design Spencer de Grey. 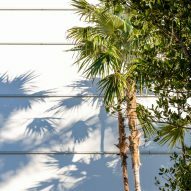 "The gardens impart a sense of identity to the Norton, connecting it to Florida's lush subtropical vegetation, creating verdant spaces for art that extends the museum beyond its walls." Six 1920s houses to the south of the garden will also be transformed to create artist residences and a home for the museum's CEO Hope Alswang. 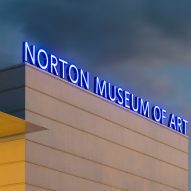 The Norton Museum of Art will open to the public on 9 February 2019. 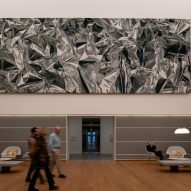 Foster + Partners, which led the design with US firm CBT as executive architect, first unveiled the renovation scheme in 2013, and work began on the extension three years later. The new wing topped out in June 2017, just before the site was hit by Hurricane Irma. The firm said that the complex received minimal damage and the Banyan tree also survived. Founded by Foster in 1967, Foster + Partners won the 2018 Dezeen Award for Business Building of the Year for its Bloomberg headquarters in London. The firm has several projects in North America, including a skinny residential skyscraper and a stepped office tower, both of which are underway in New York. Meanwhile in Chicago, Foster + Partners completed an Apple Store with a roof shaped like a giant Macbook, and is among five firms in the running to complete the city's new O'Hare airport terminal. Photography is by Nigel Young, courtesy of Foster + Partners.